The following is a guest post by Mike Manley of the Oregon Department of Consumer and Business Services (DCBS). Along with colleagues, Mike and DCBS conduct a study comparing workers’ compensation rates across states to compare and contrast . The website for the study is here, which includes an interactive map and a link to download a summary. Now onto the report. It’s fall, and many Oregonians’ thoughts turn to rankings. While football fans in the state may brag about the Beavers’ or Ducks’ impressive national rankings, the more important ranking number for Oregon’s economy is 39th, as in 39th in workers’ compensation premium rates, where 1 is the highest costs and 51 is the lowest costs . The Oregon Department of Consumer & Business Services has just released its 2012 ranking study on the topic. This study has been cited in a number of national publications, and its findings have also been incorporated in several nationally known business climate studies. The results of the Rate Ranking study are closely watched across the country, because it is the most timely and comprehensive resource on the topic. Why the big deal? 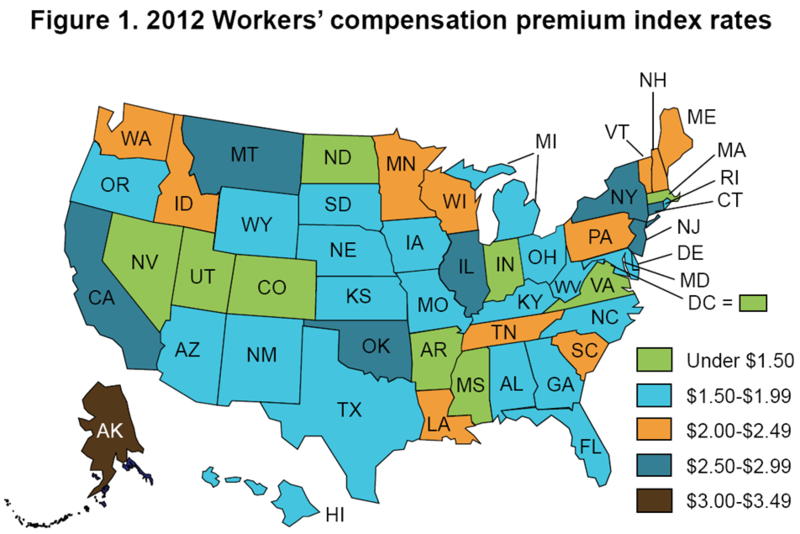 Employers in every state, with limited exceptions, are required to provide workers’ compensation insurance coverage for their employees. State laws define employers’ and insurers’ obligations within each state’s workers’ compensation system. While there are certain similarities, many aspects of these systems can differ, such as particulars of coverage, benefits, and dispute processes. One result of these differences is that employer premium costs differ substantially from state to state, which impacts employers’ costs of doing business. The question of how these rates compare is simple, but getting the answer is complex. The DCBS study has been providing the answer to Oregon policy makers on a biennial basis for 26 years. In the first study (1986), Oregon was among the most costly—6th highest, to be exact. States differ in a number of ways that make premium rate comparisons complicated. Each state’s economy is different, so their mix of hazards and risk classifications is different. In order to level the playing field, the study asks, “If every state’s economy looked like Oregon’s, how would their rates compare?” To answer this question, the study uses premium rates for a selected set of occupational risk classifications across all states. A weighted average premium rate per $100 unit of payroll (or Index Rate) is calculated for each state, using Oregon payroll figures as weights. In essence, we are making states’ economies comparable, by making them all look like Oregon through the Index Rate computation. These Index Rates are then used to rank the states. In the 2012 study, these index rates varied from a low of $1.01 (North Dakota) to a high $3.01 (Alaska.) The median value in this study was $1.88; Oregon’s index rate was $1.58, or 16 percent below the 2012 national median, and ranked 39th out of the 50 states plus D.C., or 13th lowest cost. How useful outside of Oregon? You might think that this process of making everything look like Oregon might also make the comparison invalid for other states. But that is not a big issue and here is why: The biggest risk classes in our study are big everywhere else, too. Check out the largest classes in the study. There top 7 Oregon classes are also in the top 10 classes in country-wide payrolls and together, they represent over 75 percent of the payroll weight in the study. This is part of why the study has become a much-watched benchmark in other states. Rank values have become less meaningful in recent studies, because there is less variation than there used to be between more-costly and less-costly states, which can make rankings more volatile. For those reasons, we publish another indicator that may be better than a rank value for looking at where a state compares over time, relative to national trends. That indicator is the “percent of study median” figure. For Oregon and its west-coast neighbors, recent years look like the following table. Remember, the percentages listed below are as a share of the national median. Values less then 100% indicate costs being less than the national median while values over 100% represent higher costs. So, Oregon is in roughly the same place relative to the benchmark of the national median that we had been in the 2006 through 2010 studies, while California and Washington have been both more costly and more volatile. So, while it may not have a triumphant ring to it, “We’re number 39!” is still an enviable position cost-wise for Oregon employers. As a reminder the website for the study is here, which includes an interactive map and a link to download a summary. I would like to thank Mike and DCBS for both undertaking the study and sharing the results both our office and with all of you. Excellent analysis of Oregon. I’m a workers’ compensation attorney in Georgia where we are seeing similar trends.